The Eclipse has become the de-facto industry standard environment host for embedded development. The embedded cross-development with Eclipse environment via a JTAG target connection is shown below. The Eclipse IDE is the framework into which the other necessary tools are integrated. Eclipse itself includes an editor, project manager and debugger interface. 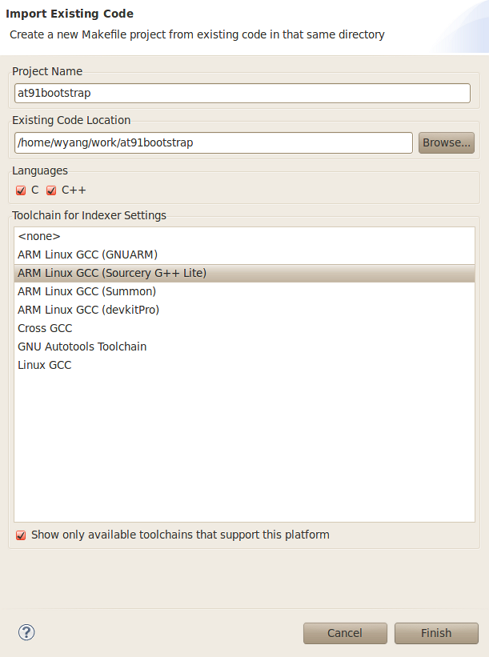 The GNU ARM Plug-Ins is intended for the embedded cross-development which C/C++ language used. 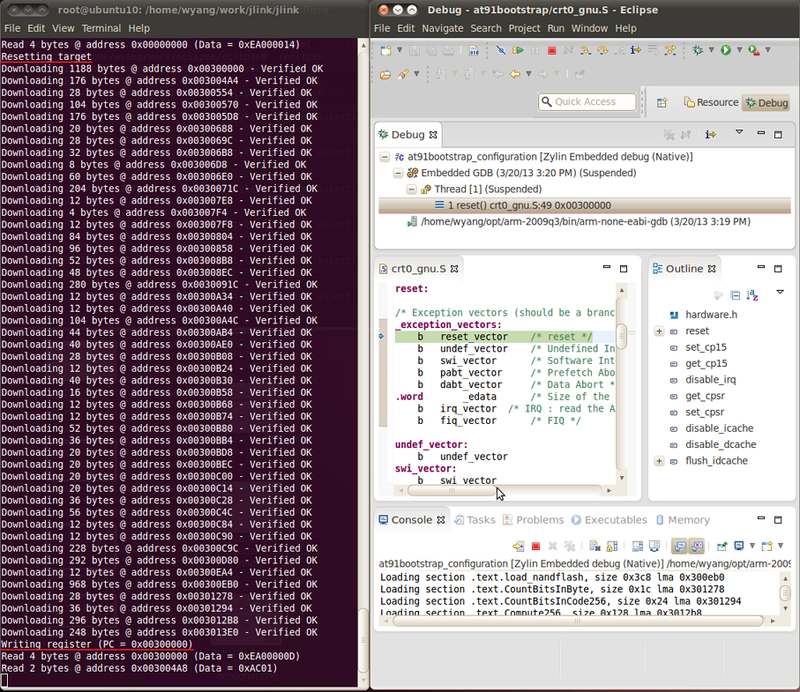 The Zylin / CDT Plug-Ins allow the Eclipse debugger to connect to a remote target via debug connection. The GNU Tools provide the assembler, compiler, linker and other code-generation utilities. The JLink GDB Server is a remote server for the GDB, and the GDB Server translates the GDB commands into the JLink commands. 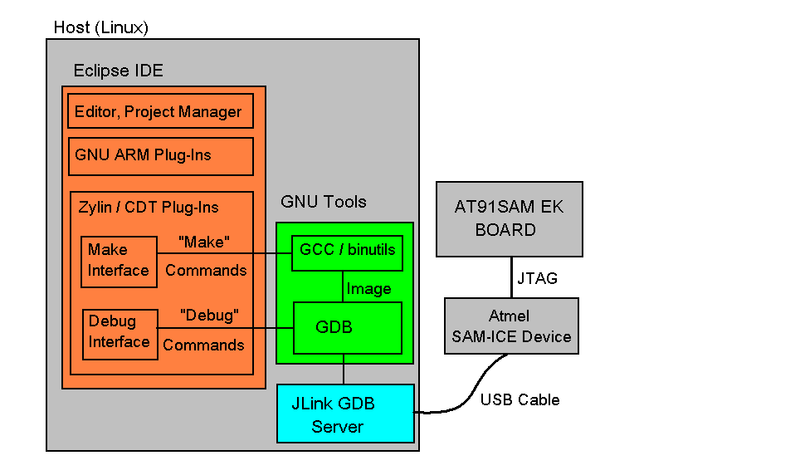 The Atmel SAM-ICE™ is a JTAG emulator designed for Atmel SAM3, SAM7, SAM9, SAMA ARM-based microcontrollers, including the Thumb® mode. AT91SAM-EK boards is the evaluation board for AT91SAM chips. This page describes how to we construct cross-development environment based on the open-source Eclipse IDE and GNU toolsets under Ubuntu 10.04.4 LTS. Download the toolchain software package( e.g. arm-2009q3-68-arm-none-eabi-i686-pc-linux-gnu.tar.bz2) from the Sourcery website. Decompress the file directly in the work directory(e.g. ~/opt ). To set environment variable "PATH", modify ~/.bashrc. To verify the cross toolchain installed properly, please type the following command. Download J-Link software & documentation pack for Linux from the Segger website (i.e. JLink_Linux_V462a.tgz). Decompress the file directly in the working directory. Copy the jlink libray to the system library folder. * To verify the JLink GDB Server installed properly, type the following command to start the JLink GDB Server. If the following message displays, it indicate the JLink GDB Server intall successfully. Note: The root permission is need to excute the JLink GDB Server. 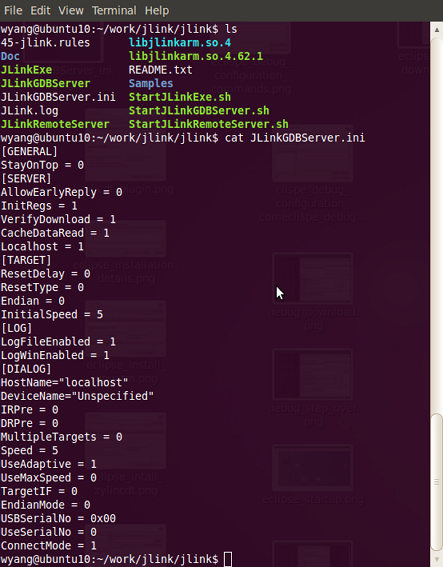 Now the JLink GDB Server is ready to run. Download Eclipse IDE for C/C++ Developers for Linux from the Eclipse website . Decompress the file directly in the working directory (e.g. ~/eclipse) then type the following command to run Eclipse. No installation procedure is required. There are two ways to install the Plug-Ins. The first way is to update directly from the corresponding website using the Eclipse standard update mechanism, this is recommended way. The second way is to first download the Plug-Ins package from respective website, and then install it. 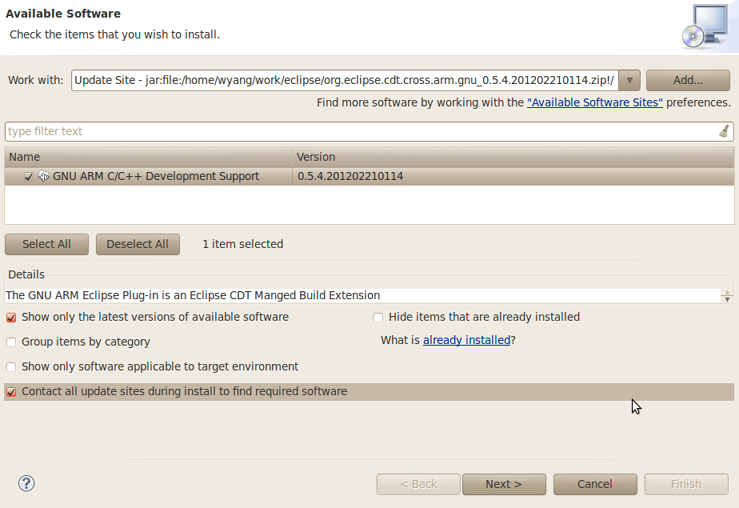 To made the cross compilation possible, install the Eclipse Plug_Ins called GNU ARM Eclipse Plug-ins. Adopt the second way to install this Plug-Ins. Then install this package, open menu Help -> Install New Software…, press Add... button, the Add Repository dialog will display. Then press Archive... to select the zip package. Select the GNU ARM C/C++ Development Support item and press the Next button. To install the Zylin Embedded CDT Plug-Ins, open the menu Help –> Install New Software… then copy this URL http://opensource.zylin.com/zylincdt in the Work with field then type enter. To verify the Plug-Ins Installation, open menu Help -> About Eclipse, the About Eclipse Dialog will display, press the Installation Details button, you will see the Installed Software. Open the menu File -> New -> Makefile Project with Exiting Code . Open the menu Project -> Build Project to build the select project. Change the CONFIG_LINK_ADDR from "0x00000" to "0x300000" in the file ".config". 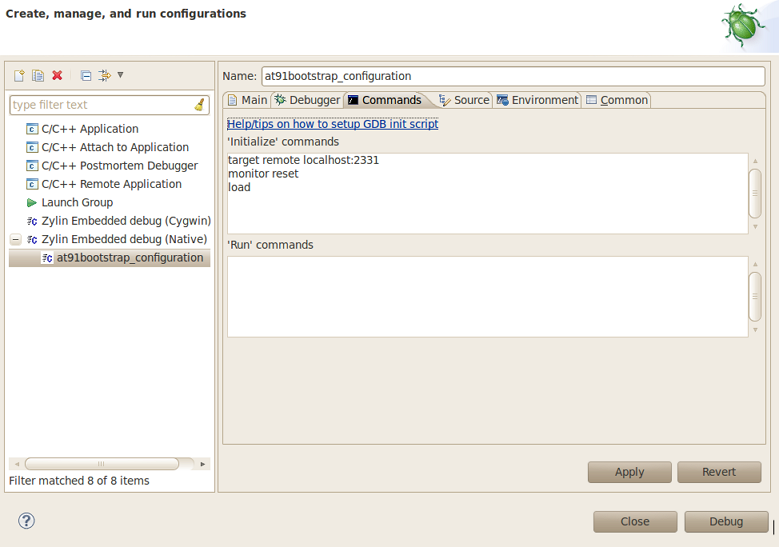 Open the menu Run -> Debug Configuration..., the Create, manage, and run configuration Dialog wil display. 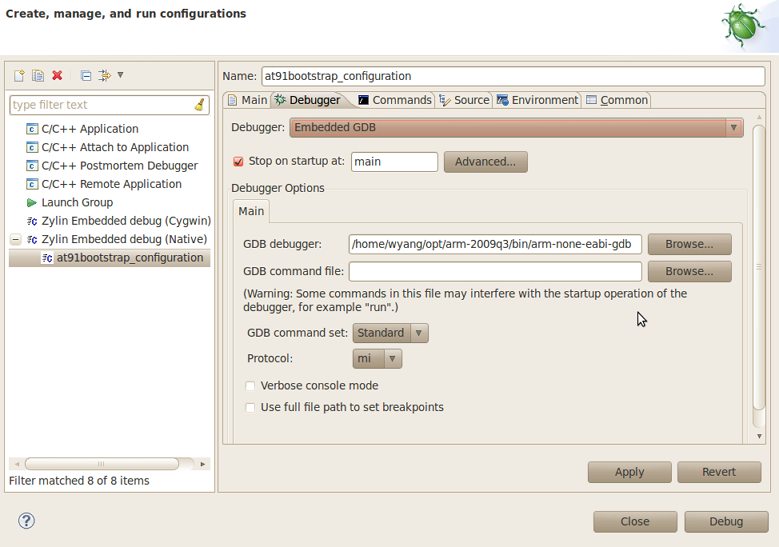 Select Zylin Embedded debug(Native) to configure the debug configuration.Input the Name, e.g. 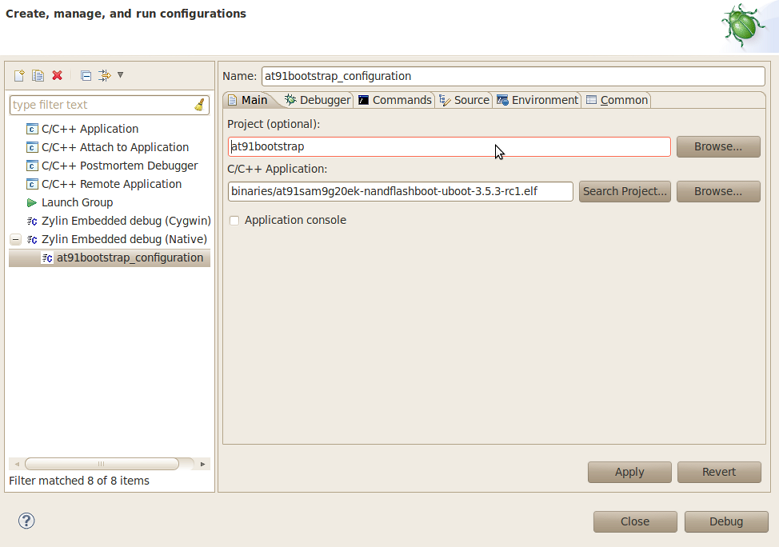 at91bootstrap_configuration. Switch to the Tab Main. Select C/C++ Application by clicking Search Project... button, e.g. "binaries/at91sam9g20ek-nandflashboot-uboot-3.5.3-rc1.elf"
Select Embedded GDB in Debugger drop down list. Select GDB debugger by clicking Browse... button, e.g. 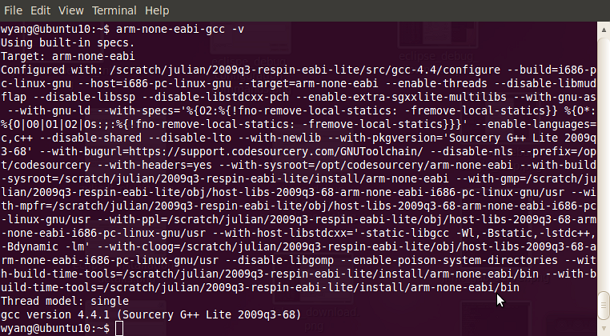 select "[INSTDIR]/bin/arm-none-eabi-gdb"
Set GDB command file to blank. Switch to the Tab Commands. Please input the following command in the 'Initialize' commands edit box. Then click Apply button to finish the debug configuration. You also could change the JLink GDB Server parameters to the suitable value. * To start debug, You should start the JLink GDB Server first. To debug the project, Open the menu Run -> Debug Configuration..., the Create, manage, and run configuration Dialog will display, then press Debug button to start debug. The successfully downloading image is shown below, the PC point to the first statement. 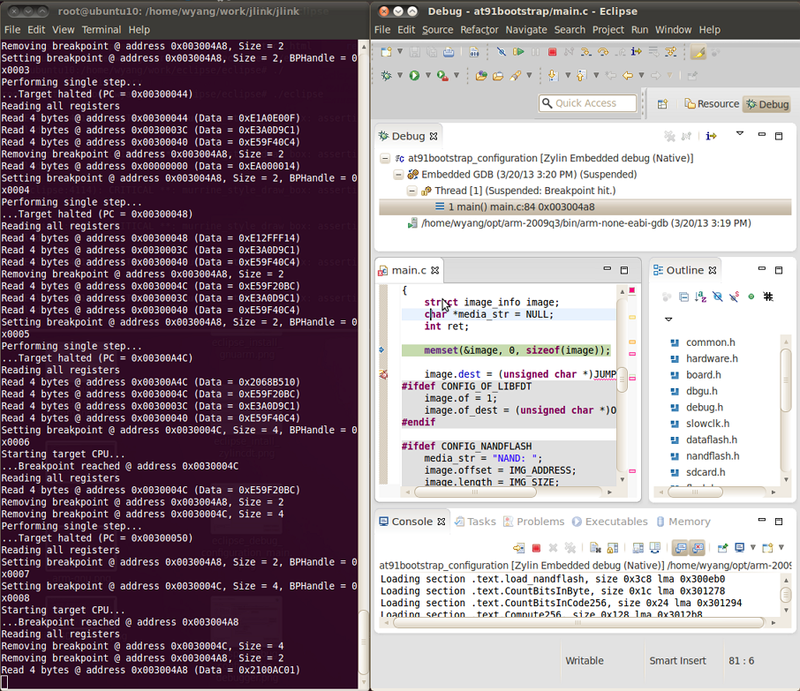 the JLink GDB Server log message is shown in the left, the Eclipse Debug Perspective in the right. Now you could debug the project, as shown below.